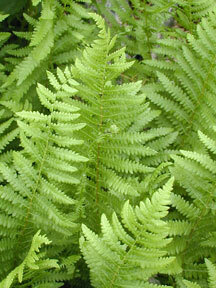 Also Called: Eastern marsh fern. Culms: Stem long-creeping rhizome, slender, to 12 inches long, 1/25 to 1/8 in diameter, branched; scales few, ovate, light brown, appressed. Leaves: Somewhat of two forms, lanceolate in outline, divided into distinct segments, each segment further partially divided; stalks slender, 3 to 24 inches, straw-colored, darker at base, glabrous above at maturity; lower surface and mid-veins minutely soft-hairy to nearly glabrous, brownish scales sometimes present; blade 4 to 22 inches long, 2.6 to 8 inches wide; sterile leaves shorter than fertile leaves, divisions somewhat broader; primary divisions nearly opposite or alternate, to 40 pairs, 1 to 4 inches long, .3 to .8 inches wide; tips pointed; division segments ovate to elliptic; margins entire or rarely toothed; tips rounded to pointed; fertile leaves taller, more erect, divisions narrower; primary divisions to 25 pairs, 1 to 4 inches long, .2 to .8 inch wide, tapering to pinnately-divided tip; lower divisions commonly shorter; division segments oblong, entire; sori round, borne on back of division segments, often running together with age and forming line around segment margins; indusium kidney-shaped, tan, without glands, often hairy. Habitat: Moist ground; marshes, wet woods and thickets, roadside ditches, stream banks, prairie ravines; sandy soils. Reproduction: Ferns are plants that reproduce by spores rather than by true flowers. Uses: The Iroquois used the roots as a gynecological aid. Comments: Dervived from Greek thelys "female" and pteris "fern". The leaves of marsh fern die back in the winter.